The landmark 1954 Supreme Court ruling, Brown v. Board of Education, brought the promise of integration to Little Rock, Arkansas, but it was hard-won for the nine black teenagers chosen to integrate Central High School in 1957. They ran a gauntlet flanked by a rampaging mob and a heavily armed Arkansas National Guard-opposition so intense that soldiers from the elite 101st Airborne Division were called in to restore order. 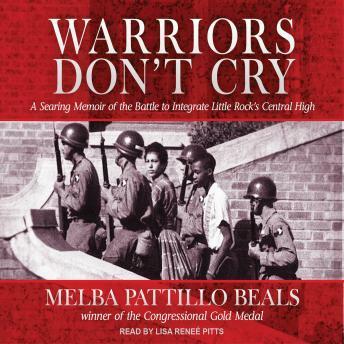 For Melba Beals and her eight friends those steps marked their transformation into reluctant warriors-on a battlefield that helped shape the civil rights movement.Warriors Don't Cry, drawn from Melba Beals's personal diaries, is a riveting true account of her junior year at Central High-one filled with telephone threats, brigades of attacking mothers, rogue police, fireball and acid-throwing attacks, economic blackmail, and, finally, a price upon Melba's head. With the help of her English-teacher mother; her eight fellow warriors; and her gun-toting, Bible-and-Shakespeare-loving grandmother, Melba survived. And, incredibly, from a year that would hold no sweet-sixteen parties or school plays, Melba Beals emerged with indestructible faith, courage, strength, and hope. Excellent book. Learned a lot how the nine were tormented at Central High School. When the righteous do nothing, and allow evil to prevail people suffer severely. If you find yourself in a situation concerning injustice, do the right thing and stand up and speak out for justice. This is how wrongs are changed. The cost may be high, but this is the assignment that God has given you.